For Part 1: Sewing Swimwear and the bikini bottom tutorial head there first. 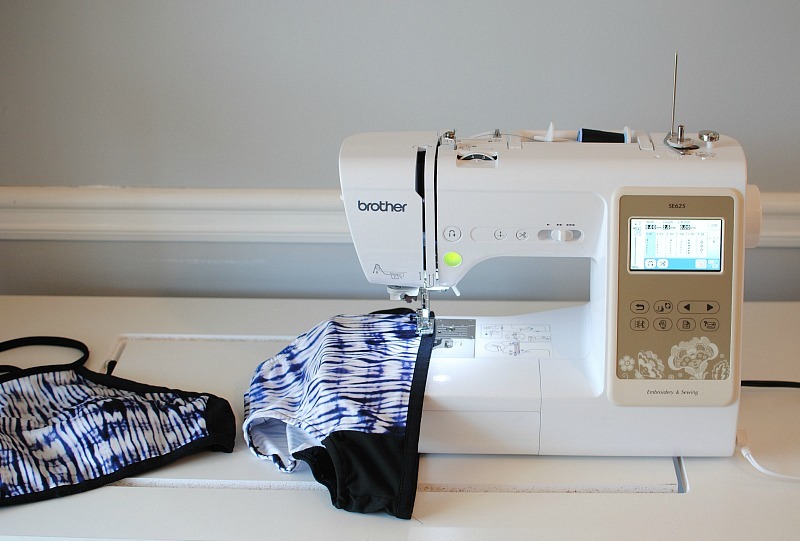 That post covers fabric, machine set up, tips, drafting a pattern, cutting, and all the details you need to know for Sewing Swimwear. 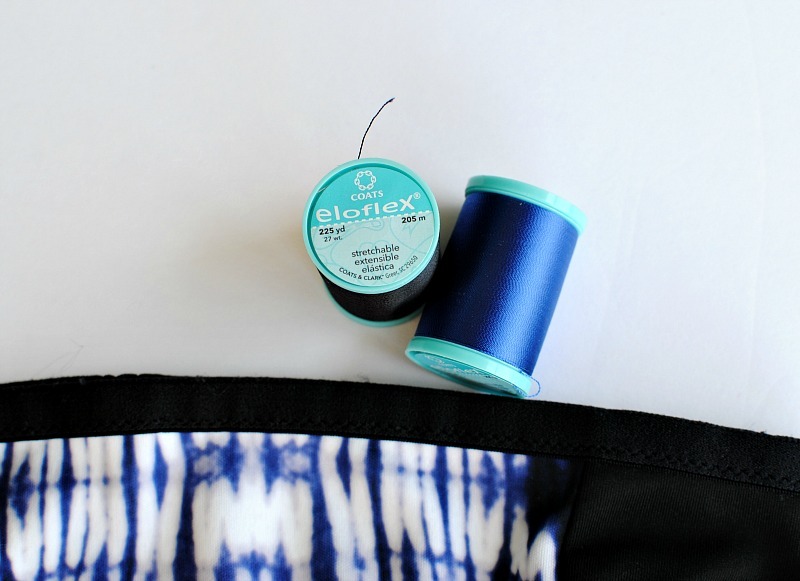 For this post we are going over sewing the bikini top using COATS Eloflex Thread that is designed to stretch with the fabric. It's a great thread to use for swimwear, fitness wear, and knits ensuring the seams and hems can expand without breaking the thread. I wanted a basic halter style suit because I'm a mom of 3 insanely active boys. I'm usually running around the beach or splashing in the pool rather than lounging if you know what I mean. I need a swim top that has support, comfort, and coverage. So I made my own and tested it out during our weekend beach trip and I couldn't of been happier. 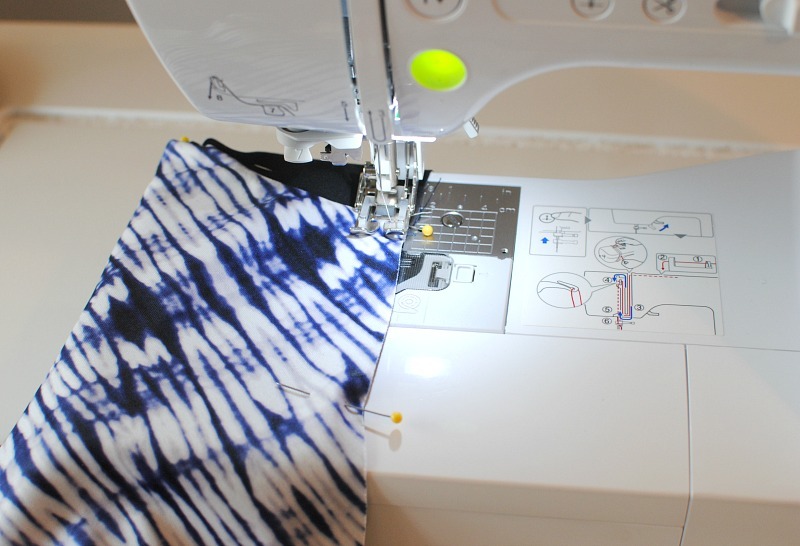 Get the details below on how to make your own swimwear. 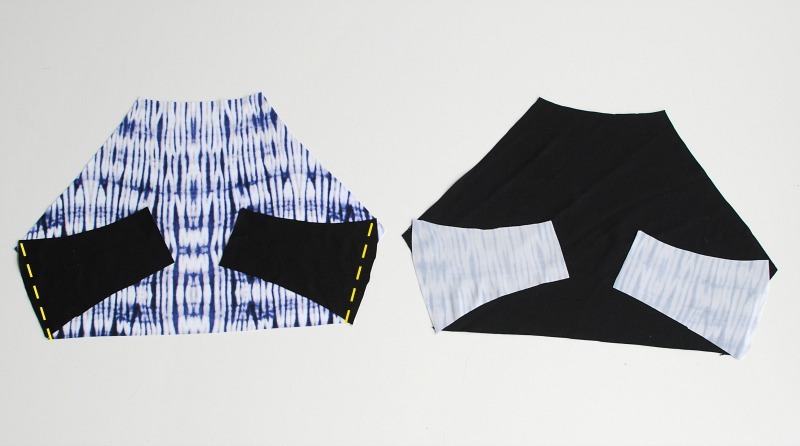 Draft and cut your pattern out. I'm doing a simple halter top. 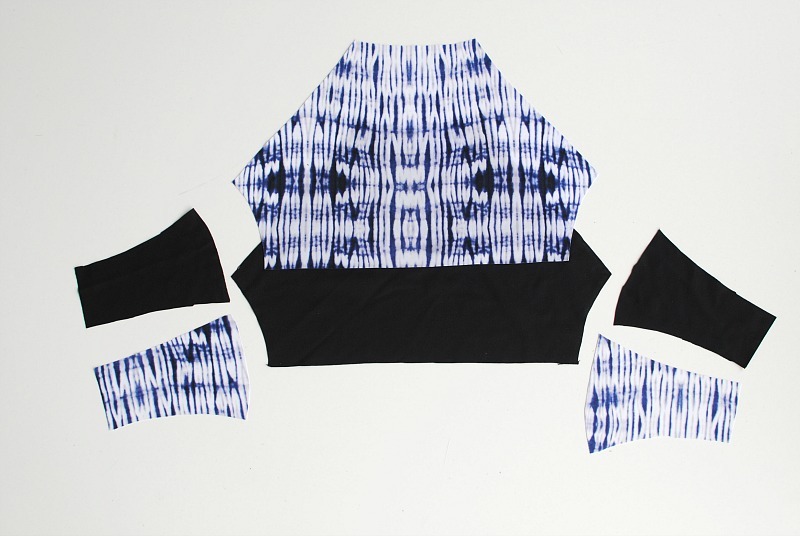 I drafted a pattern from a swim top I had onto pattern paper (I used parchment paper) and added side panels as well. All the pieces cut out using a rotary cutter and mat. Sew or serge the side panels on both the front and liner. 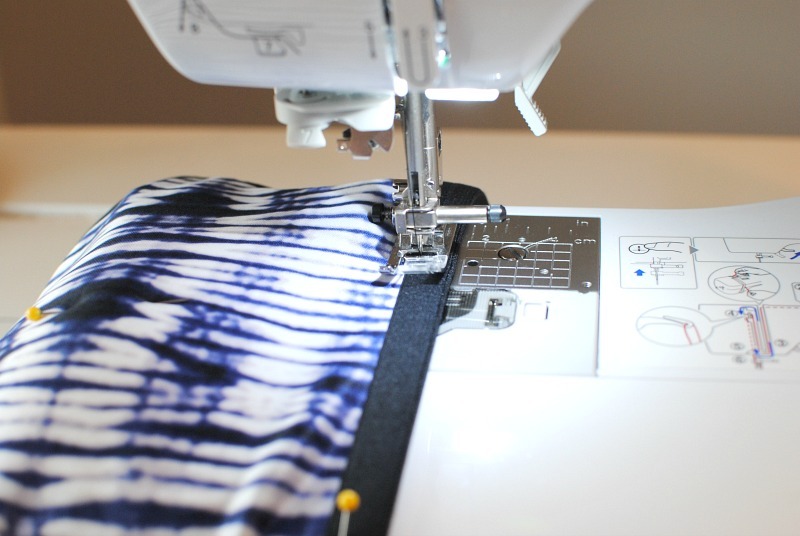 When using COATS Eloflex thread it isn't necessary to use a zigzag stitch. I used a standard straight stitch and ball point needle. Place front and back WRONG sides together and pin. This is a good time to insert cups if you plan to use them. I added them and tacked them down on the back/liner with a hand stitch so they didn't move. Sew front and liner together. I then serged everything together after sewing to clean up the edges. To give the suit more support I used Fold-Over elastic (FOE) as binding around the sides and bottom edge. You can also use the elastic method I shared on the bottoms in Part 1. Measure the arm opening and cut your elastic 1" smaller. The general rule is the FOE should be shorter than the opening. 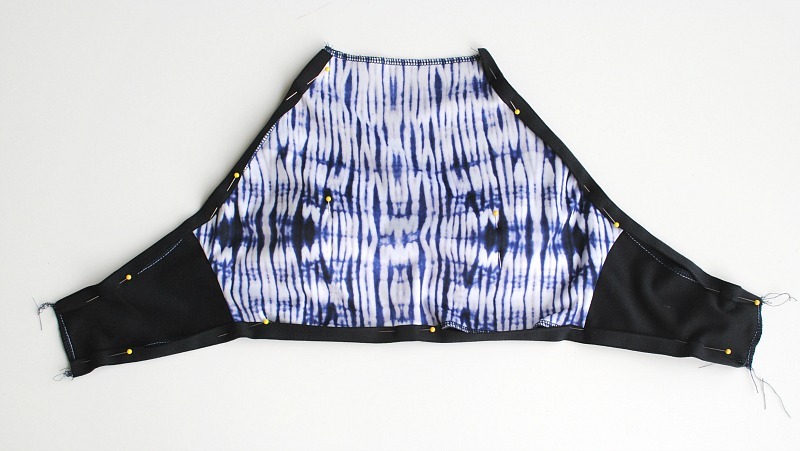 I usually do my elastic on curved edges about 80% smaller than the garment measurement. On straight edges I may do 95% or none at all if their is already negative ease. For the bottom edge I cut 1/2" smaller and again I made this part just slightly smaller because it's a straight edge. You will have to adjust and test things when it comes to your garment which is part of the process. Tip: If you do plan to use FOE make sure to add that into the pattern. For example you may want to remove 1/4"-1/2" from the pattern edge to account for it. You will need to evenly distribute the elastic. Measure and mark off the quarters on the garment and the elastic. Pin the FOE encasing the raw edge matching the quarter marks together. You will need to stretch the elastic to match with the garment marks since the elastic should be slightly smaller. Sew the FOE to the sides and bottom edge...You can use a standard straight stitch or I like to use a slight zigzag (2.5) making sure to encase the front and back of the FOE. Tip: When sewing elastic edges, pull the elastic with minimal tension on straight edges and about 60-70% on curved edges. Again using FOE. Cut a large amount of FOE as you will be using this to criss cross in the back and tie into a bow. Mine measured _. Fold the strip in half to get midpoint and pin at midpoint of neckline. Start sewing (zigzag 2.5) at one side of the neckline pulling just slighty. Once you reach the end of the neckline continue to sew along the edge of the FOE strip (without pulling at this point). Sew all the way down till the edge. You will want to fold the bottom edges inside to give those a clean finish as well. Then go back up to the other FOE strip and repeat for the other side. Lastly, fold over the side edges 3/4" and sew along the raw edge to create a casing for the back strap. 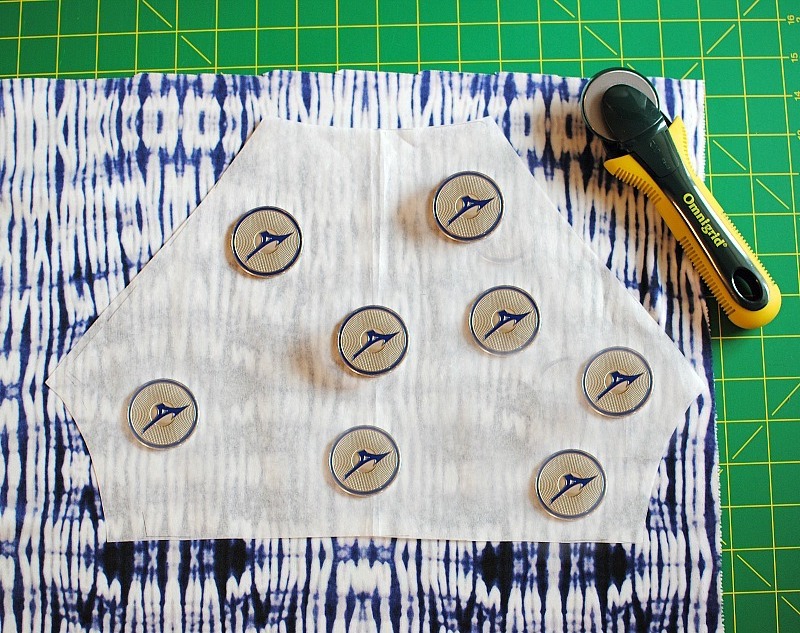 Cross the straps, pull through the side casings (with a safety pin or loop turner), and tie! What a superb idea! You are very good at sewing. And this beautiful model of swimwear proves you are great designer as well! Many thanks for such a good step-by-step explanation. It is a easy way to earn money and enjoyment . I like homemade items. it's special and unique. 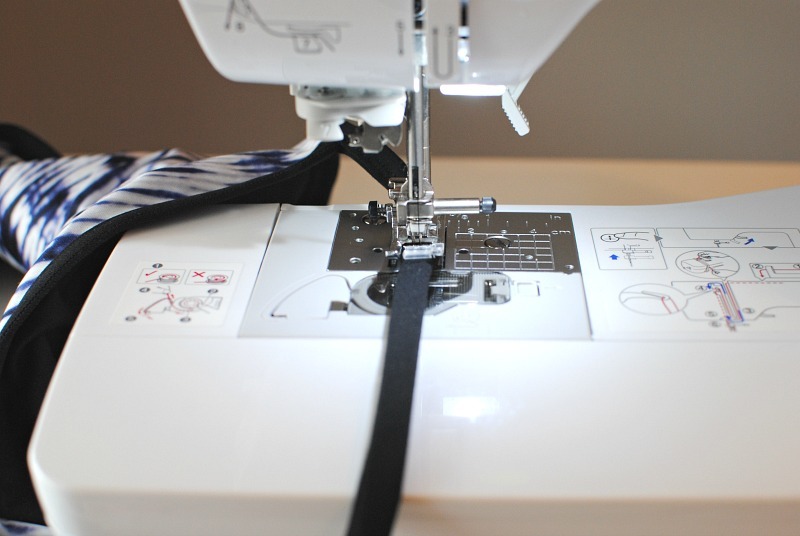 This is a really awesome to have a sewing skills and a branded sewing machine fully loaded with lot many features. 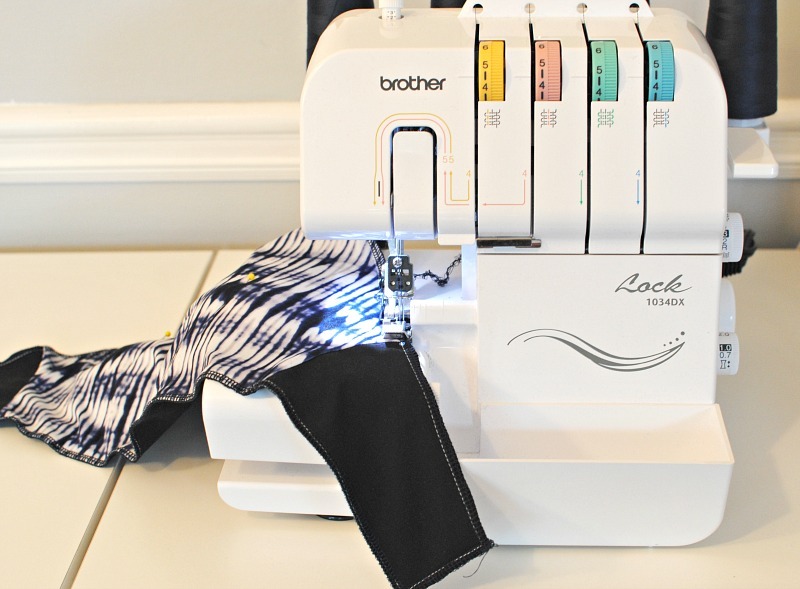 You can do anything with your clothes through this sewing machine and can make lot many transformations with your dresses. You can visit below site to get more ideas. How long does it take to complete this article? I have read through other blogs, but they are cumbersome and confusing. I hope you continue to have such quality articles to share! Wow! I'm shocked how easy to make such a swimming suit. I like it so much mmmm! Oh, guys! Look at this website more info. Here you can find a help with writing papers. This is nice post and it may help to many women as this is quite simple and easy to do for those who can use sewing machine with ease. You can check out here too. Great post. Thanks for nice idea. Great design, great use of sharp and clever mind. I liked it too much I also have my home sewing machine using that I will definitely try this design. Very nice post and amazing skill. I suppose it was at hobby first, but now it seems you are master in sewing. For students who are passioned in their hobbies but must do writing asssignments, there is an option to contact some good wrtitng service like ours. This is certainly additionally an exceedingly wonderful offer everyone truly qualified on the lookout with. It's always not likely everyday there is chances read a little something. extremely well written article as Latest Sarkari Result . I will be sure to bookmark IBPS Recruitment and return to read more of your useful information. Thanks for the post. I’ll certainly comeback. This is certainly additionally an exceedingly wonderful offer everyone truly qualified on the lookout with. Whenever you need a quality help, for example with case brief writitng, keep in mind this reliable writing service https://superbessay.com/buy-case-brief-writing/. This is certainly additionally an exceedingly wonderful offer everyone truly qualified on the lookout with. It's always not likely everyday there is chances read a little something. extremely well written article as . I will be sure to and return to read more of your useful information. Thanks for the post. I’ll certainly comeback. I found your blog using msn. This is an extremely well written article as . I will be sure to bookmark it and return to read more of your useful information. Thanks for the post. I’ll certainly comeback. I'd like to thank you for the efforts you have put in writing this blog sarkari naukri. I'm hoping to check out the same high-grade blog posts by you in the future as well. This is an extremely well written article. I will be sure to bookmark it and return to read more of your useful information. Thanks for the post. I’ll certainly comeback. Thank you! I searched long and hard for a perfect edging for a baby blanket. Now that I've seen this one studychat.in, I can't believe I didn't see it everywhere!